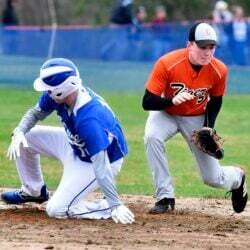 Mustangs get even with Mountain Valley in MVC action. MONMOUTH — It takes both the head and the heart to win a soccer game. 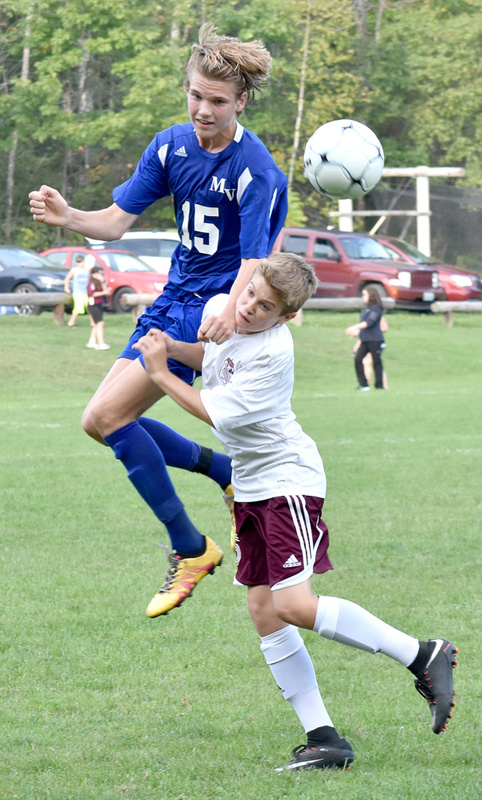 Mountain Valley and Monmouth Academy each lacked one of those at one point in a Mountain Valley Conference boys soccer clash Tuesday, which played a part in a 2-2 draw. 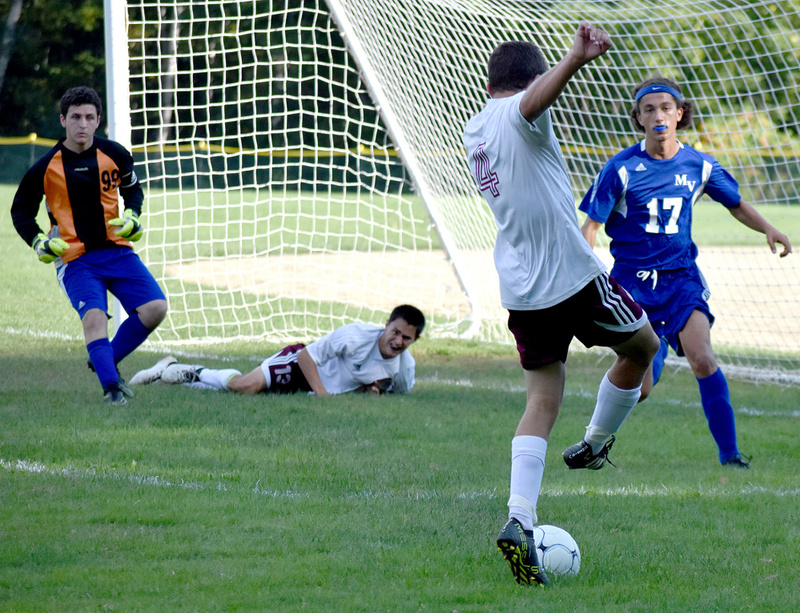 A converted penalty kick in the final seconds prevented the Mustangs from absorbing their first loss of the season, but the Falcons kept them out of the back of the net in overtime at Chick Field. Facing defeat, the Mustangs (7-0-1) were awarded a penalty kick on a “questionable call,” Fletcher conceded. Falcons (4-1-3) goalie Jacob Rainey got a little too aggressive in protecting himself from an oncoming Monmouth player making a run into the box and the whistle was blown. Avery Pomerleau, the Mustangs’ standout senior striker who had until that point been held quiet, calmly converted to tie the game with 11.9 seconds remaining in regulation. Rainey and the Falcons defense spent the first 79-plus minutes frustrating the Mustangs. 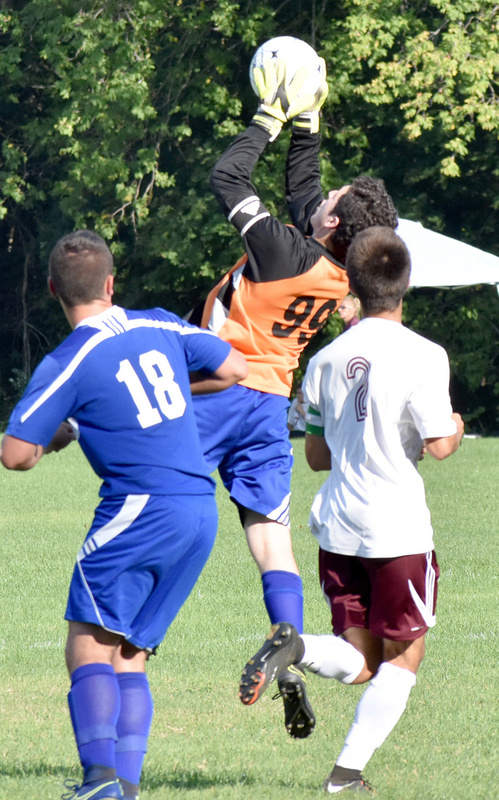 Monmouth only put four shots on target before the Pomerleau penalty kick, and only a header from Wade Coulombe midway through the first half got past Rainey. Pomerleau helped set up Coulombe’s goal, which tied the game at 1-1. He won possession of the ball in the right corner, then passed to Cameron Armstrong, whose cross into the box found Coulombe’s head. “I thought ‘OK, well we scored that goal, we got it back. We’ll start playing the way we’re capable of playing,’ and we still, we didn’t do the things that we practice and we preach,” Fletcher said. Espen Lamberg got the Falcons on the board just over two minutes prior, getting open on a long kick by Moritz Wehrheim and blasting an open shot past Monmouth goalie Bradley Neal. The Falcons took the lead again 14 minutes into the second half when Cam Gallant sent a long ball up to Dalton Noyes, who took advantage of a Monmouth defender’s mistake and looped a shot over Neal. “I’ll give them credit, they played hard and they played skilled, but we shot ourselves in the foot so many times,” Fletcher said. The Mustangs came closest to breaking the tie in the two five-minute overtime periods. Pomerleau missed high and wide on an early chance, and the Falcons did just well enough on a dangerous ball off a late corner kick in the first extra period to force a second.